Tracey Maciver's new book is just as jam packed as the first one with lots of Activities, games and challenges to do outside including using a range of tools, how to look after them and exciting things to make using tools. Aimed to inspire you when working with children and groups outside the classroom. Suitable for teachers, playworkers, outdoor practitioners, Forest School leaders, early years practitioners, Scout and guide leaders, group facilitators, team building, nature awareness event organisers and home educators. Don't go outside the classroom without it! Using the outside as a learning space is a good way to extend your classroom, home or nursery. There is very little that cannot be done outside. 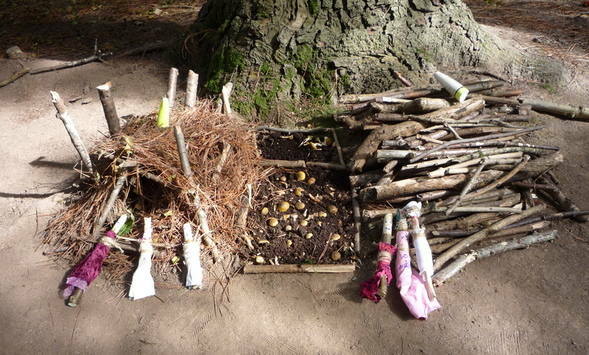 Many early years and foundation stage practitioners have been using their outdoor space effectively for a long time and the importance of outdoor learning is permeating its way through the education system. Outdoor learning for many children and young people is special and memorable and ripe for deep level learning experiences. We have been delivering Forest School and outdoor learning experiences for the last 10 years and have a wealth of expereince working with early years settings, childrens centres, early years workers, primary schools, nurture groups, gifted and talented groups, special needs, young people, the probation service, social services, family services, secondary schools, FE colleges, universities, conservation groups, training days and conferences.